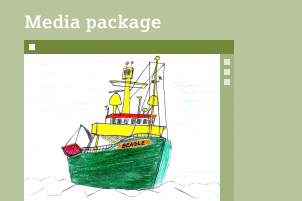 The media package contains three learning environments on “Materials and their properties.” The context is established through the fictional story of Professor Cousteau’s research expedition around the world. All students will independently conduct experiments on the material properties magnetism, electrical and thermal conductivity, hardness, behavior in water, and solubility. Afterwards, the students will create fact sheets on selected materials. The topic can be covered in grades 5 and 6 of elementary school and in science and technology subjects in secondary schools. The materials are based on the framework curriculum of Berlin/Brandenburg and are designed for inclusive teaching. The inclusive learning environments are adapted to the potential and needs of students with different levels of educational readiness, and some also contain special media on language development and on fostering high-achieving students: All students work through the same topic, while a low-threshold starting point, incremental hints, and subtasks for further study at a different level take into account the students’ individual working and learning paces. Material for inclusive teaching created by the Senatsverwaltung für Bildung, Jugend und Familie Berlin (Berlin ministery for education, adolescents and science) in cooperation with Siemens Stiftung. The files of this media package are available individually, plus all these media are combined in the “Learning environments for inclusive teaching: Material properties – A research expedition” PDF file. This file can also be downloaded.